​Hometown: Gloucester, New Jersey, U.S.
Died: November 15, 2004 in Operation Iraqi Freedom. Unit: Marines, 2nd Battalion, 5th Marine Regiment, 1st Marine Division, 1st Marine Expeditionary Force, Marine Corps Base, Camp Pendleton, CA. Corporal Marc T. Ryan,of Gloucester City died suddenly on November 15, 2004 at the age of 25. A dedicated Marine Corp Corporal he gave his life for his country in Ramadi, Iraq while serving his country with pride and honor. The son of Former United States Marine Thomas E. Ryan and Linda (nee Sharp). He was the brother of Christopher D. Ryan and his wife Khara of Gloucester City and Lauren D. Ryan of Haddon Heights. His maternal grandparents were the late William J. (Former United States Marine) and Barbara H. Sharp formerly of Gloucester City abd his paternal grandparents were the late James M. and Ruth Ryan. Great-grandson of Delinda Gabriele of Medford, NJ and Margaret Heitz of Sacramento, California. Loving uncle of Laney, Justin and the late Logan T. Ryan. Sweetheart of Cathy Cerminara of PA. Marc was born, raised in Gloucester City and was a 1998 graduate of Gloucester City Jr./Sr. High School, where he was captain of the Gloucester City High School Football Team, 1997 All South Jersey Football Player, All Tri-County, All Group 2 First Team and received the Larry Pusey Award from Gloucester City High School for Courage. 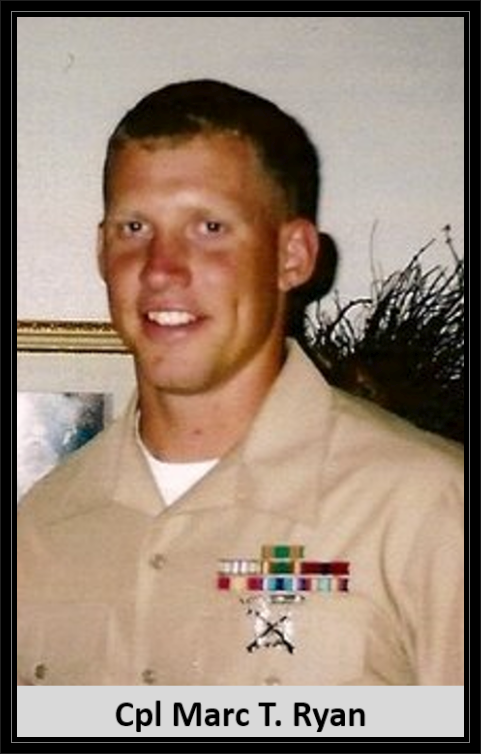 Marc was a weapons specialist for the United States Marine Corps and served our country with pride, honor and courage. He is a hero to all and fought for the freedom of those less fortunate. Entombment with full military honors at Harleigh Mausoleum in Camden with his late grandparents. Family requests that memorial donations be made in Marc's memory to "Marc T. Ryan Scholarship Fund For Special Needs Students" 1300 Market Street, Gloucester City, NJ 08030. Attn: Mr. Joseph Gorman. Please make checks payable to Marc T. Ryan Scholarship Fund. Expressions of sympathy can be e-mailed to the family through www.mccannhealey.com. On Nov. 15, 2004, Marine Cpl. Marc T. Ryan, 25, of Gloucester City was killed by a roadside bomb in Ramadi. A third-generation Marine, Ryan saw combat in the mountains of Afghanistan. He saw it again in Iraq, and his family in Camden County thought he'd seen enough of war. But in the spring of 2004, Ryan re-upped, knowing it would almost certainly mean a return to combat. Ryan's brother, Christopher, asked him why. Marc T. Ryan "His exact quote to me was, 'Too many of my brothers are dying over there, and I need to go back over and try to make a difference with that,'" Christopher Ryan said. A standout football player at Gloucester City High School, Ryan considered careers in teaching and law enforcement, but his brother said the Marine Corps continued to appeal to him. He returned to Iraq shortly after re-signing. 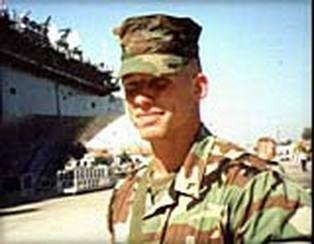 Ryan, a graduate of Gloucester City High School's class of 1998, was posthumously awarded the Navy and Marine Corps Commendation Medal, decorated with a bronze "V" for valor.